It’s difficult to come up with circumstances in which a blowout 42–7 win over the Eagles on the last day of the season could be depressing — even if the Giants had a losing season, wiping out the Eagles to finish it off would have a certain cathartic kick — but yesterday would have to be the day. The Giants did exactly what they needed to do to keep their playoff hopes alive. The problem was that it was the first time they’d done that in three weeks. The problem was that it was too late. The Giants did their part, but their losses to Atlanta and Baltimore in the last two weeks were too much to overcome. Once the Bears beat the Lions about fifteen minutes or so after the Eagles game ended, the Giants’ playoff hopes were kaput. (Even if the Lions would have won, the Vikings’ win over Green Bay later would have finished off the Giants, too.) The Giants came into Monday needing a miracle to sneak in the playoffs. They didn’t get it. Yesterday’s result aside, they didn’t deserve it. The Giants have been infuriatingly inconsistent all season, and even though those two Super Bowl titles led fans to believe the Giants would always just find a way — not a terrible thing for fans to believe about their team — the losses to Atlanta and Baltimore were too much to survive. Though those losses in Weeks 8 and 9 to Pittsburgh and Cincinnati, respectively, proved just as damaging, if not as memorable. It's the sort of year that seems primed to provide nothing but regret. Of course, the real problem might have been the ascendance of Robert Griffin III and the Washington Redskins. After all, the Giants finished with the same 9–7 record that they did last year. 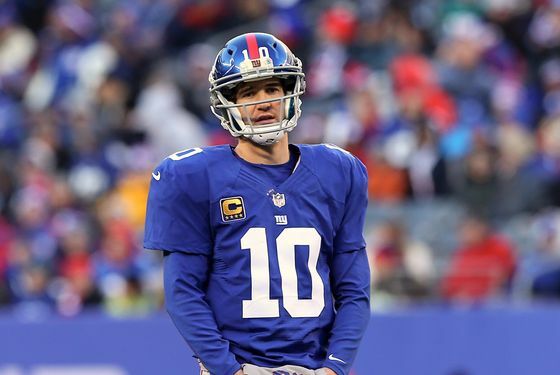 The problem was that the Redskins won their last seven games, and the Giants couldn't keep up. That's no reason to fire anybody. But that's a reason to be concerned for the future. The NFC East has a new threat. And the NFL, now, is about to crown a new champion.